New York, NY – September 20th, 2018 – Iron Cove, a division of EPIC Brokers, this week, was named Best US Insurance Provider by Hedgeweek, a Global Fund Media publication, which reaches over 98,000 financial services executives globally. 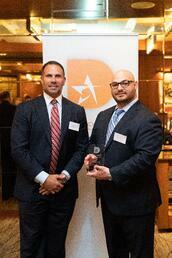 Louis D’Agostino, President & Financial Institutions Practice Leader of Iron Cove Partners, accepted the award Thursday night at the Intercontinental Hotel in NYC. Iron Cove Partners has become an industry leader among American insurance brokerages, and it currently serves many of the world’s most prominent financial institutions. As Principal, Lou D’Agostino is responsible for the oversight and management of the Financial Services practice, which provides its expertise and experience to hedge funds, registered advisers, private equity funds, and broker-dealers. Iron Cove, a division of EPIC Brokers is a leading full-service national insurance brokerage firm serving the financial services industry with its Headquarters in New York City. A trusted adviser with decades of experience and over 150 Hedge Funds as clients, Iron Cove provides cutting edge brokerage and consulting services to some of the globe’s largest financial institutions. The company provides the full spectrum of insurance products and services including Employee Benefits, Commercial Property and Casualty, Transactional M&A Insurance as well as Private Client, Life Insurance and Estate Planning.